Asphalt Patching – Clean Sweep, Inc.
Pavement that needs patching is a safety issue for pedestrians, negatively affects your property’s appearance and more. If you have potholes in your pavement, cracked curbline areas, etc., it is imperative they be fixed quickly. Not only is patching more expensive the longer the holes are left, but they are dangerous for pedestrians. Since pavement sweeping requires a good seal between the air sweeper’s sealing system and the pavement, your parking area cannot be kept as clean when their are potholes in the pavement. Further, the loose gravel will get tracked into your interior floor spaces, which will quickly increase the wear on those surfaces, as well. 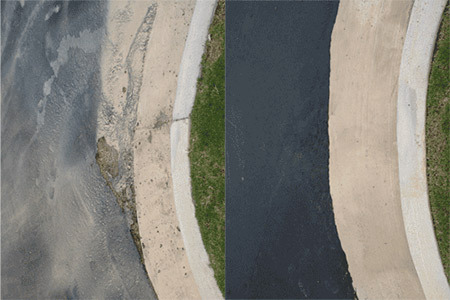 Clean Sweep offers the personnel and most advanced infrared equipment needed to repair potholes inexpensively, and in a manner that will look good and extend the service life of your pavement. When this is done in a timely manner, the job is extremely cost-effective, especially when compared to the negative impacts you will see with leaving potholes in place. Be sure to check out the capabilities of our Kasi infrared asphalt repair system! If you currently have potholes in any paved surface, we invite you to contact us for a free assessment and proposal for services.